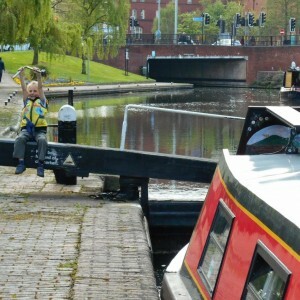 Narrowboating Chick | Pottering Around; Messing About by the Canal. Absolutely no hurry to get up this morning, even though the birds were singing and the sun was shining. We decided upon bacon & egg sarnies for breakfast (how come they did not taste as good as they did when I was steering down the W&B??) 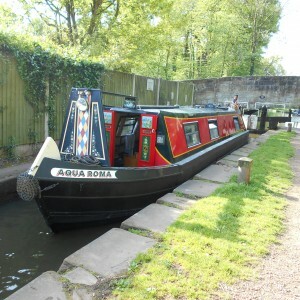 eventually, we headed on towards Kinver, mooring up below the lock at 10.30 ish. We had a little explore round teh town and had an aborted attempt to find Kinver Edge, so went for a cuppa and a scone instead. Even though it was Sunday, there were plenty of cafe’s to choose from and a real buzz about the town. The weather was glorious and it was a lovely way to waste a few hours. We bought a few supplies (beer) at the Spar shop and headed back to the canal. By this time there were a lot more boats passing each direction and one waiting at the lock- as we were in a sunny spot, we decided to let him get ahead, whilst we did some pottering about. When we did get going, we timed it right as the lock was empty and we were able to get through without any problems. We kept catching up with a boat that was from Austcliff, but although they were not the speediest, we kept on drifting behind, so it did not pose a problem. 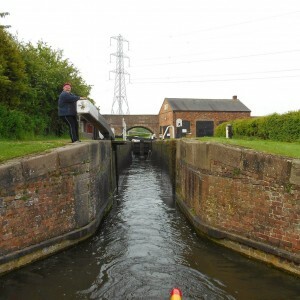 Although we had only gone through a few locks, getting water and sorting the hot water out at Greensforge took a while, so we decided that enough was enough as the evening was drawing to a close. 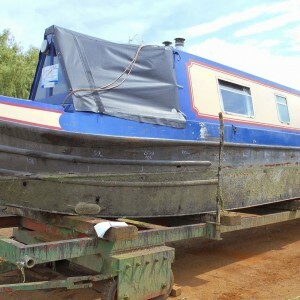 We did not want to end up by the moored boats at Hinksford, so we moored just round the corner from it and just below the mobile home park. Again a beautiful spot- calm, quiet and peaceful. The moon shone so brightly and reflected itself on the still water- lovely. PS- Have mentally shopped at Ikea for space saving sofabed and hideaway ironing board.